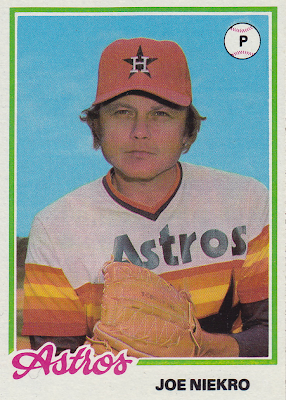 Many 1970s oddball sets seem like a Google Image Search for "old baseball photos." The sheer quantity of player images out there, even for obscurities like Robert Joseph Thorpe, would fill out a ton of issues, if actually organized and printed. Collector and businessman Larry Fritsch pulled together a bunch of otherwise hard-to-find fellows as One-Year Winners. 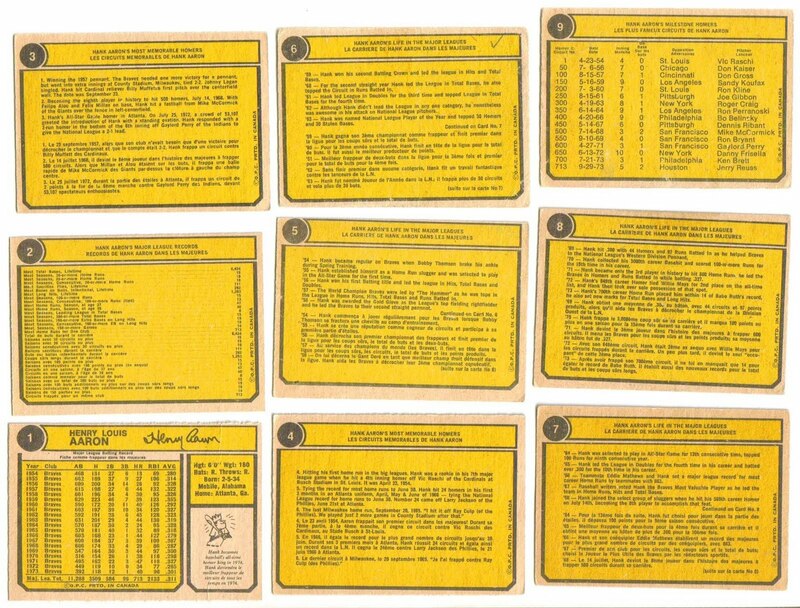 1977 was the first of 3 "OYW" series and its 18 card checklist includes Eddie Gaedel and Chuck "The Rifleman" Connors. Many OYW stories could also be called "one-game wonders," such as pitchers who made a single impressive appearance or batters who went 3-for-3 and never played again. 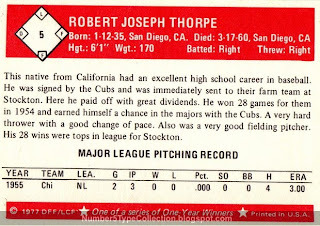 Bob Thorpe didn't blow anyone away for the Cubs, but he did go 69-44 in the minors. Against all odds, there's at least one autographed OYW card out there. Mr. Fritsch still offers complete series on his web site and individual cards on eBay, where #5 (and other "commons") cost $2 or $3. 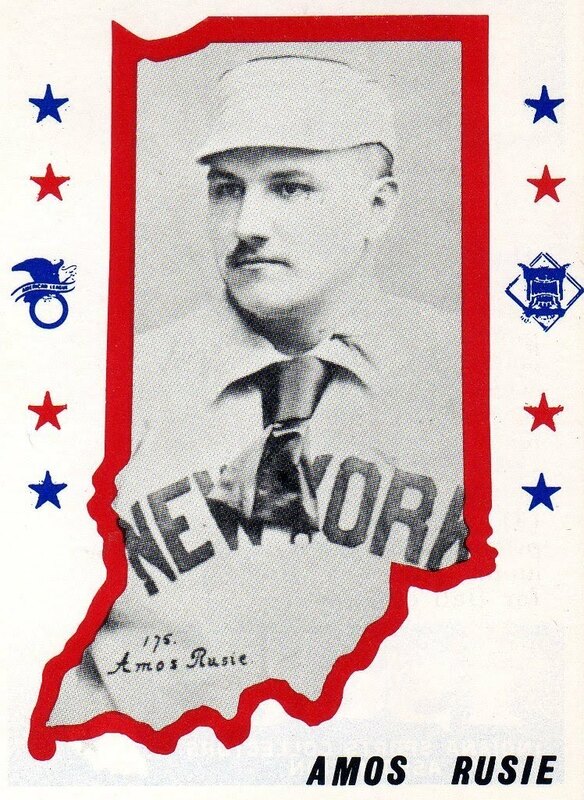 Today' guest made a home state debut in 1889, winning 12 games for the Indianapolis Hoosiers as a fresh-faced 17 year-old. 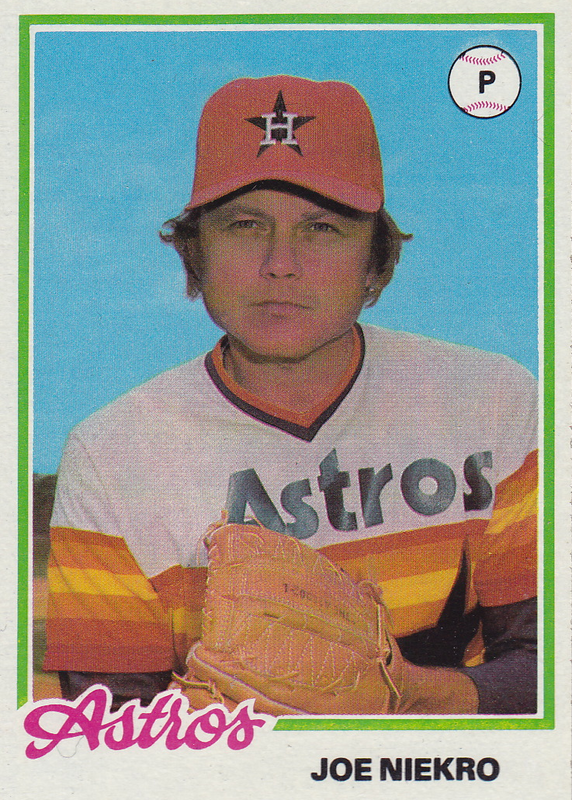 He started 22 games and finished 11 as a reliever, hurling 225 innings total and striking out 109 batters. 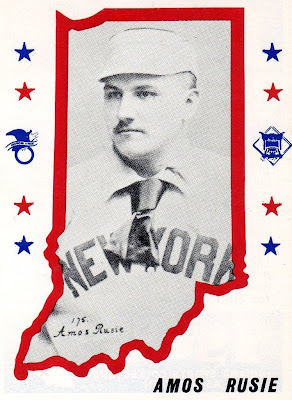 That's a full season by today's pitching standards, but barely hinted at Amos' next decade as a moundsman, when he'd average over 400 innings and total 245 victories. 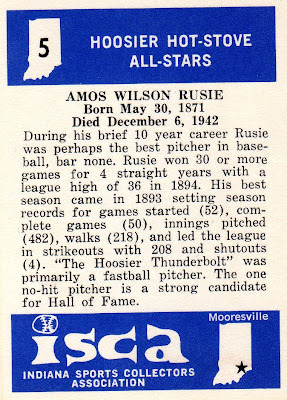 The Indiana Sports Collectors Association published this bicentennial-themed 26-card set in 1976 to honor local players and teams who contributed to baseball's considerable history. 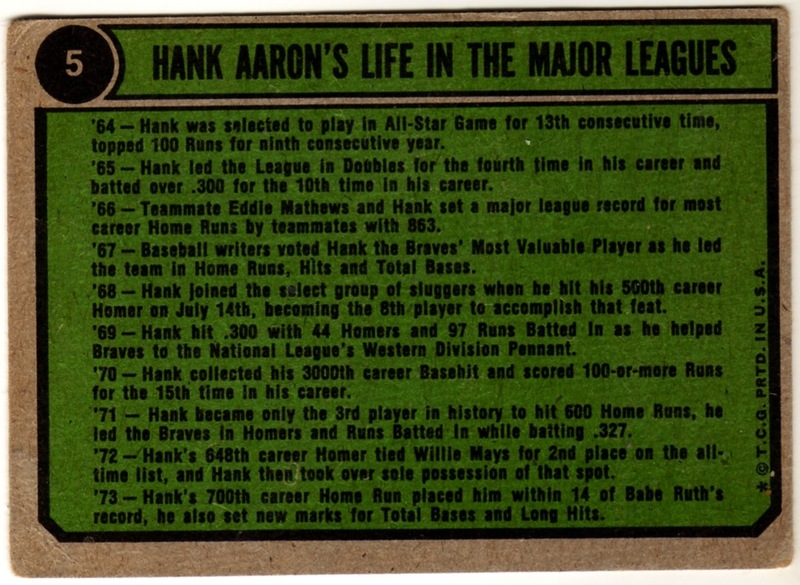 The checklist contains plenty of name-worthy guys; Don Larsen and Gil Hodges are 2 of the non-HOFers. I assume sets went out to ISCA members, making them hard to come by today. 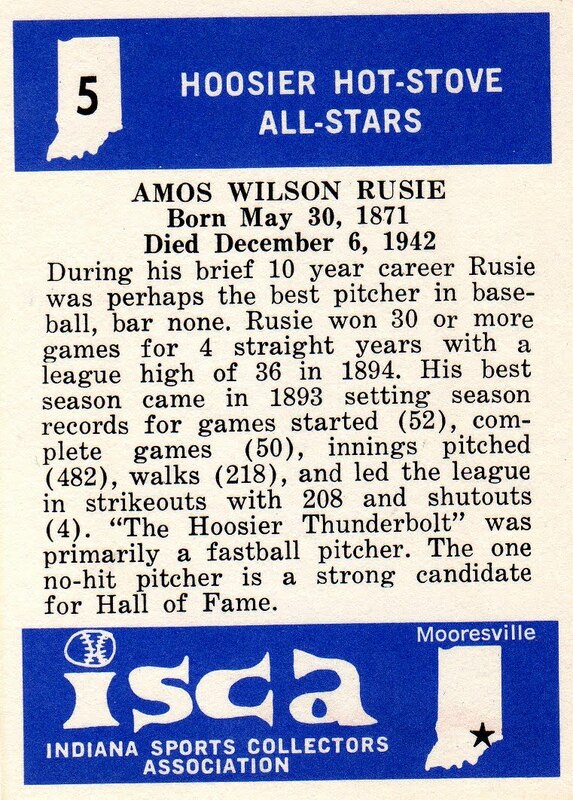 Two things stand out on Rusie's card, "strong candidate for [the] Hall of Fame" and "brief 10 year career." Indeed, the Veterans Committee voted Amos onto a plaque for 1977, validating the ISCA's editorial acumen. 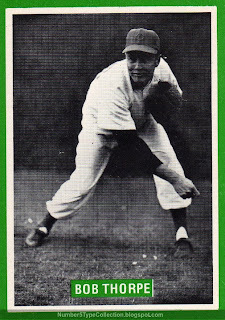 Fellow Hoosier (and card #14) Hodges nearly joined him the same year by receiving 58% of the BBWWAA vote. So is it better to burn out than to fade away? Like previous #5 guest Dizzy Dean, Rusie's career included a block of dominant performance followed by a quick fade. 3 appearances for Cincinnati in 1901 count as a "season," which snuck him past the HOF's 10-year career minimum. It's not clear if anyone remained alive to lobby on Amos's behalf--as former Gashouse Gang members benefited from Frankie Frisch--so his selection's probably deserving, if plucked from a different epoch. 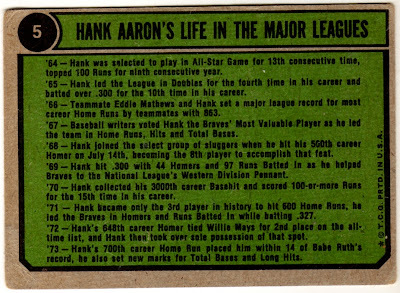 The front of each Special reprints Topps Aaron cards four at a time--a nice treat for younger collectors--and backs recount his considerable career achievements in 10-year chunks. The front of #5 covers 1966 - 1969 and its back summarizes each year from 1954 to 1963. 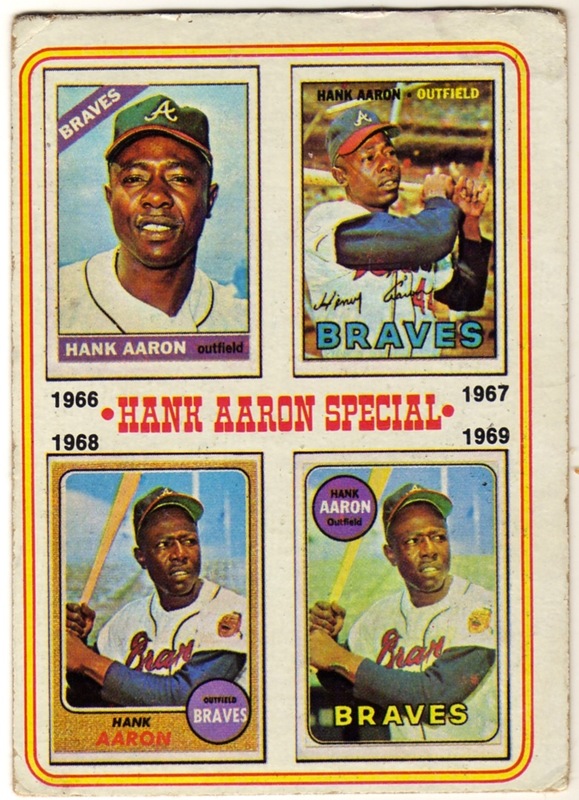 Montreal-based candy maker O-Pee-Chee (OPC) continued to license Topps baseball sets for distribution in their Great White North, but did some extra legwork for the Hank Aaron Specials. Pursuant to Canadian law, card backs had to include both English and French. Two languages meant less room for commentary, so they chopped the specials down to 2 front images and backs listed bilingual 5-year highlights (instead of blocks of 10). 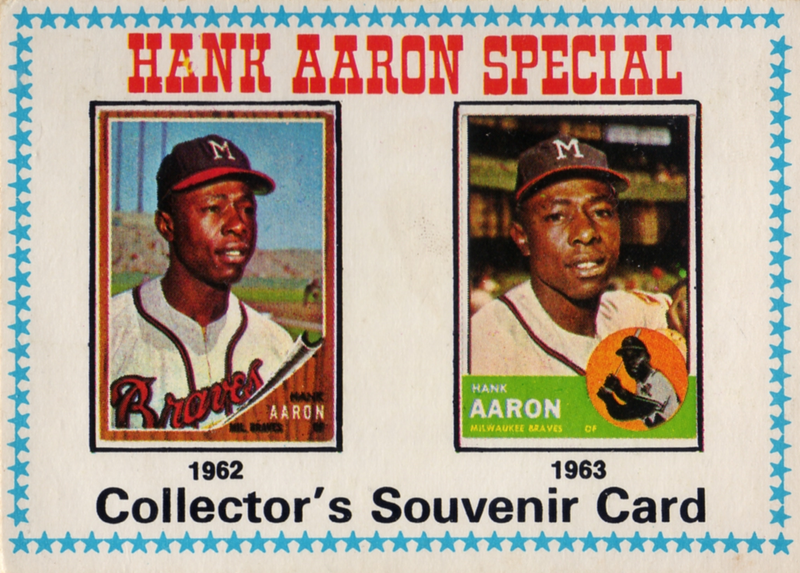 Both sets cover the same ground at different "speeds," so OPC #5 gets Topps 1962 and 1963 on the front and 1954 to 1958 highlights on the back. 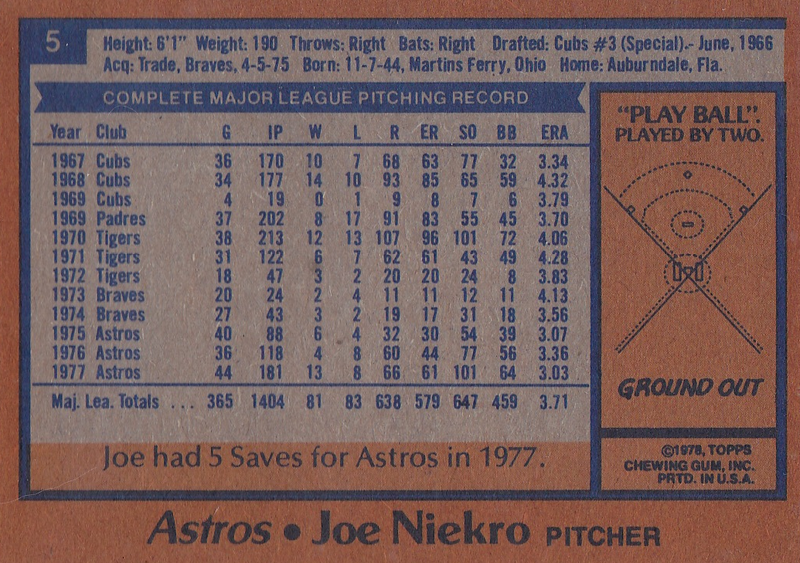 OPC's 2-images-per-card approach took 9 cards to cover fully, displacing Hunter, Theodore, and Lolich to later numbers in the set. Including those players, in turn, bumped other cards from the set entirely. 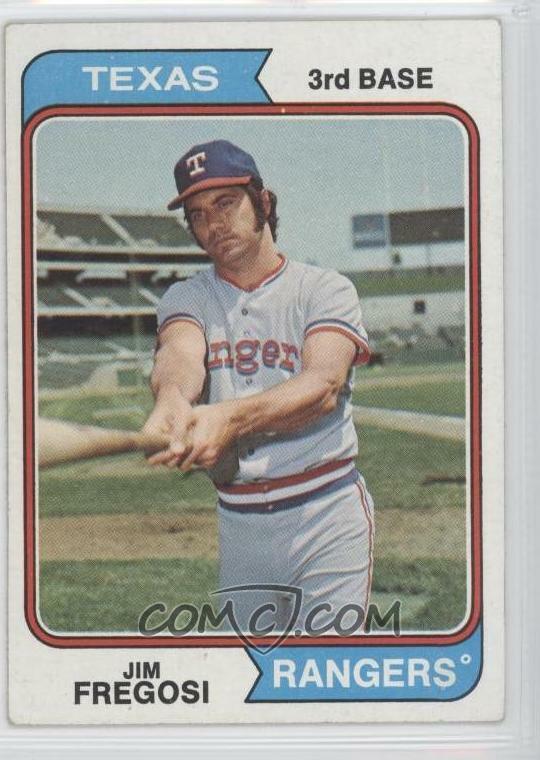 Short story, the loser in this game of musical chairs is Jim Fregosi, dropped from OPC in favor of HOFer Catfish Hunter. Sorry, Jim, you'll have to blame Canada! Value: Aaron cards from the 1970s remain affordable. I picked up each #5 on this page for less than $10. 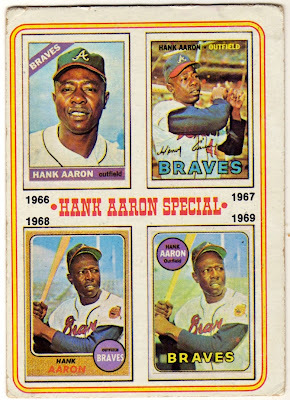 Fakes / reprints: Hank Aaron cards turn up in plenty of Topps retro sets, but I haven't seen any fakes of his 1970s cards. Massachusetts-based National Chicle Gum published their 192-card Batter-Up set across 3 years, 1934 to 1936. The high series (#81-192) contained today's promotional bonus, a 20-booklet insert of "How To" pamphlets. At 3" x 4", they're larger than the actual cards, so came folded in quarters. Collectors refolded it vertically to make it look like a tiny book. 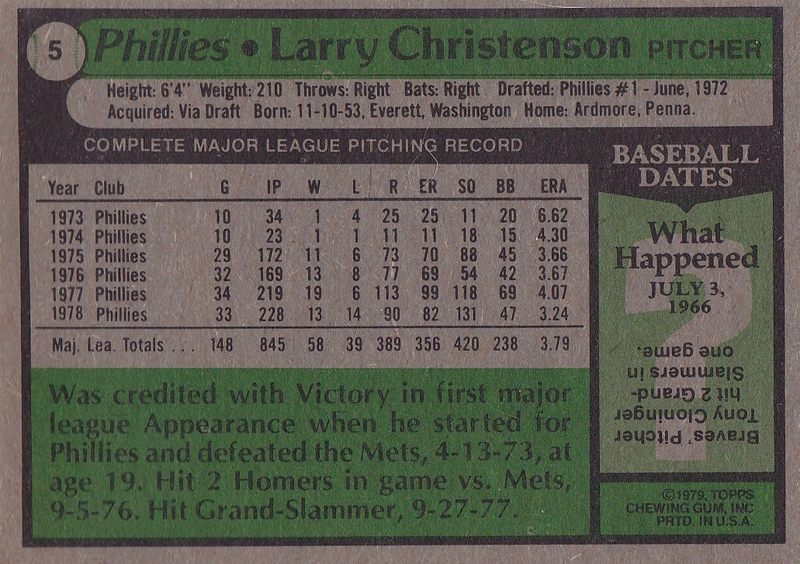 Check the scan's vertical "guide," with back page to the left and title on the right. The second scan shows the "inside" pages. 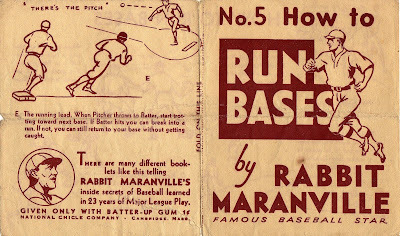 These 20 booklets (Old Cardboard gallery here) cover basic playing skills, but include interesting esoterica like "how to pitch the out-shoot," "in-shoot," and "drop." (In modern parlance, those are the slider, screwball, and sinker.) 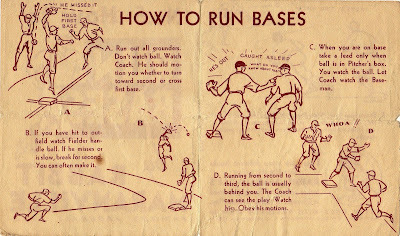 "How to Run Bases" covers the main points for any level of player: run everything out, move with the pitch, and watch your coaches. Venerable magazine The Sporting News (aka TSN) distributed a pair of 200-card sets in 1915 and 1916 as promos for their weekly publication. 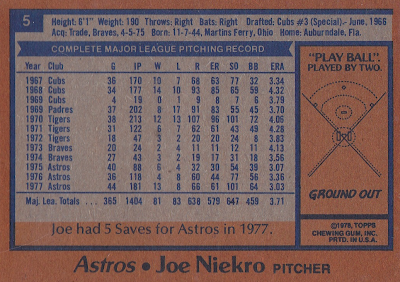 The 1.5" x 3" cards feature players from their photo catalog, printed on thick stock with heavy front gloss. 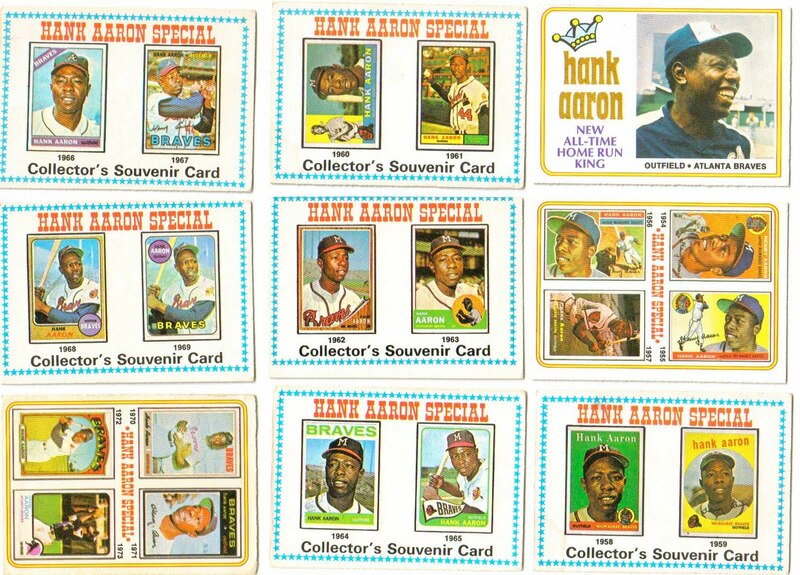 Fortunately for modern collectors, this combo's also durable and a large number survived into the 21st century. Most "competing" sets from that era used hand-tinted images or awkward drawings, making TSN's photography superior by default. The set suffers from time-lag, however, as Cardinal-in-a-Giants-uniform Leon "Red" Ames amply demonstrates. Let's track the time line! 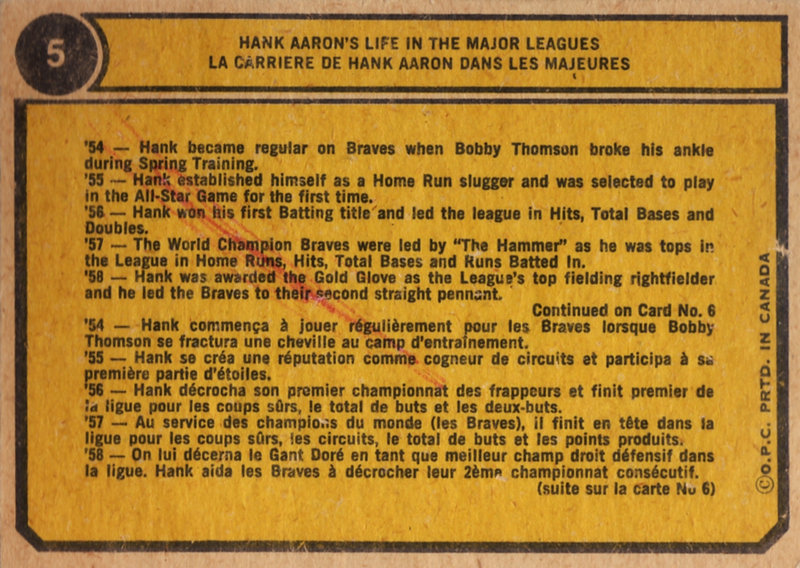 Post-1915: TSN produces Ames card as "St. Louis"
While we call TSN's 1915 and 1916 issues "sets" and catalog them as 1916 M101-4 and 1915 M101-5, I have a feeling the magazine itself wasn't that organized. OldCardboard.com's excellent combined checklist details the numerous differences, including swapped players, pose changes, and editorial corrections. (Their card back gallery is also impressive.) M101-4/5 seems like a rolling release, updated sporadically over at least 2 years, that we--90 years later--are reassembling like a puzzle, in search of a coherent image. 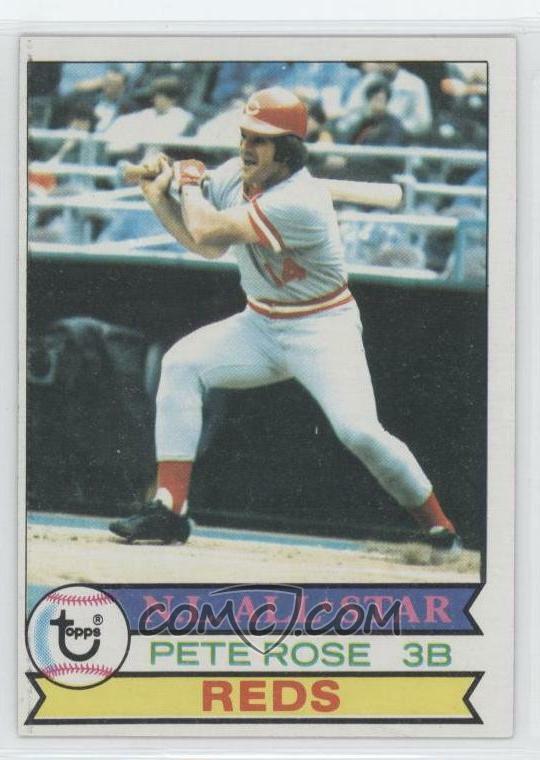 Value: My card's trimmed down to the photo and player name, so cost me only $15. Full cards with a complete, white border cost significantly more. I manned first base in little league and my dad's a huge Dodger fan, so Steve Garvey made a natural favorite player for many years. In the mid-70s, Garvey seemed almost more "traditionally American" than hot dogs and John Wayne. (Sport Magazine even featured him on a 1976 cover eating apple pie, don'cha know.) A star for several years, Steve fell just short of the HOF, though some think otherwise. His personal foibles aside, Steve could hit the ball, won 4 straight Gold Gloves, and helped the Dodgers reach the playoffs several times, so Post Cereal saluted him with a 12-panel set in 1978. 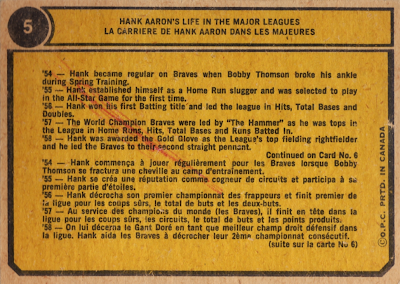 Each cut-away card includes Garvey's mug, several sentences about a particular skill, and baseball-stitch edging. They came on the outside of cereal boxes, so are blank-backed. Notice the upper-left corner, where Steve's head overlaps the top of this "card." 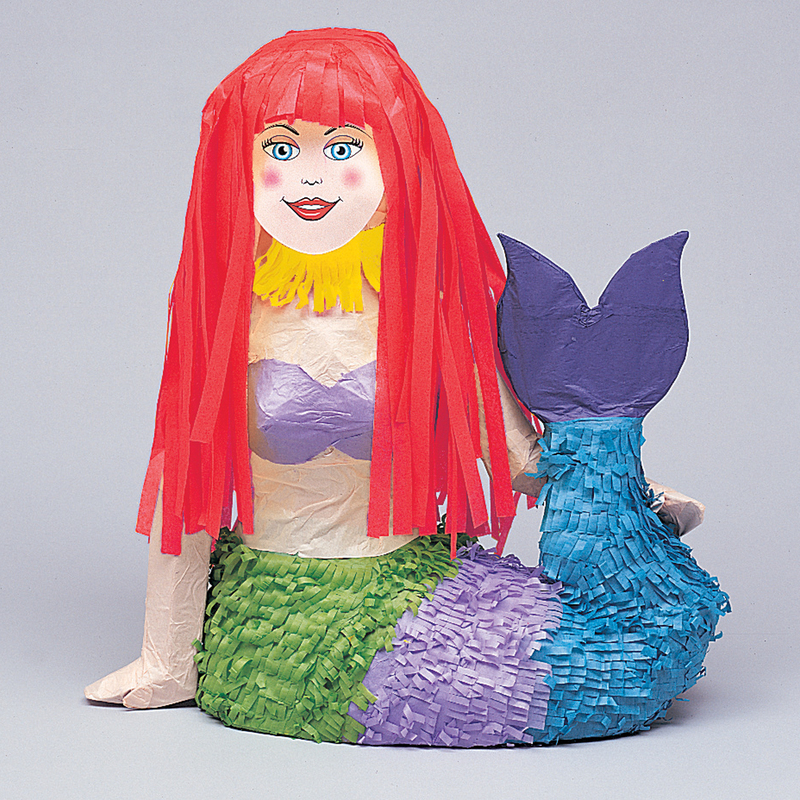 Doesn't that invite well-meaning kids to simply chop off the top of his head? It's a fairly subtle curved cut around the cap. Think of the children! Speaking of kids, check out the opening paragraph. One of the easiest looking and potentially most embarrassing plays is the pop-up. It must be practiced continuously and an emphasis must be placed on proper body positioning. The 1989 movie Parenthood included several baseball scenes, focusing on Steve Martin practicing pop-ups with his son, a key skill for middle infielders. The extra work eventually saves a game, as his son catches a pop fumbled by another (obnoxious) player, redeeming their time spent together. Baseball, apple pie, American families. Single panels don't turn up often, so I purchased the entire set for $12 to obtain this #5. Don't see any Post panels in the market right now, but will include some search links, just in case. 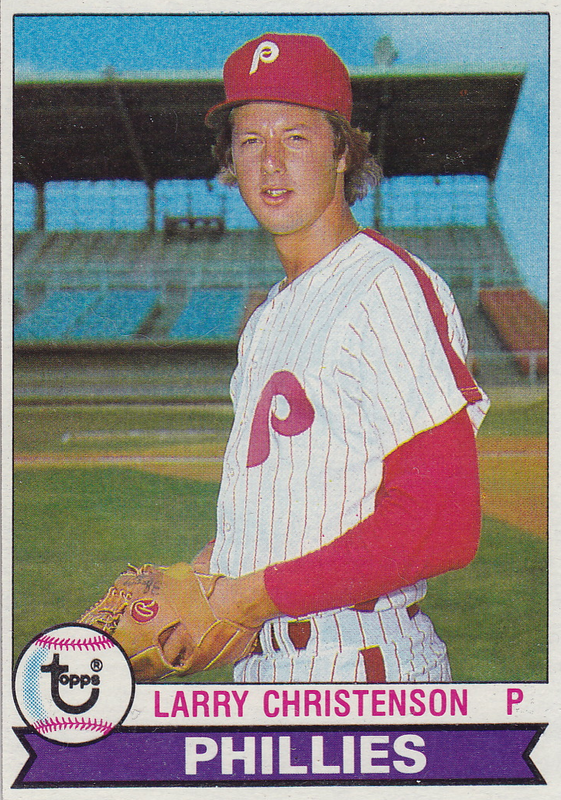 Back in mid-1978, Philadelphia traded veteran outfielder Jay Johnstone to New York, perhaps as depth for their run to October. He pinch-hit, played some OF, and DHed five times, as the Bombers went on to beat the Royals in the ALCS and LA in a 6-game World Series. After a slow start in 1979, more trade winds took Jay to San Diego, and he eventually landed in LA for the 1981 rematch series, won by the Dodgers. That raises an interesting question--how many players captured titles with both the Yankee and Dodger franchises? 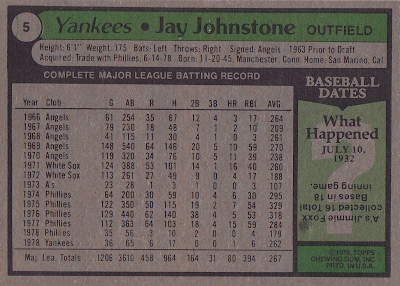 Like the 1979 Burger King Phillies, the Yankees set differs from Topps' normal offering in renumbered players and a separate checklist card. 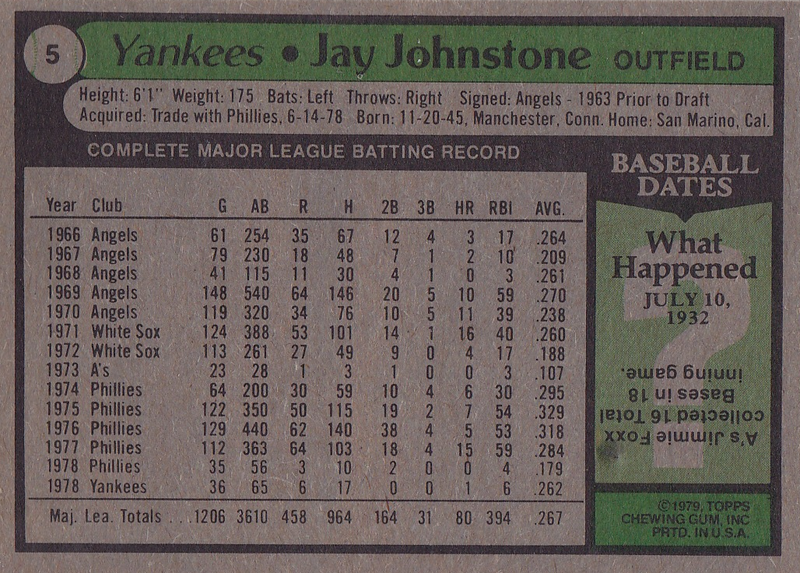 Off-season acquisition Tommy John also got his own Yankee card (#9), instead of Topps #255 (as a Dodger). 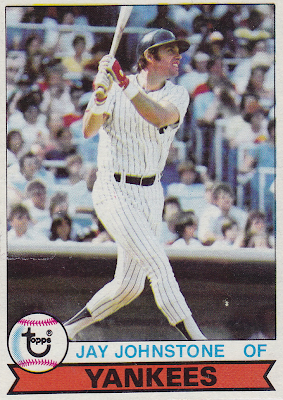 Value: Though loaded with stars like Reggie Jackson, Thurmon Munson, Ron Guidry, and Catfish Hunter, you can find complete Yankee sets for under $10 and single cards for ~$1. Fakes / reprints: No reprints that I know of, but people sometimes confuse BK cards for the regular Topps. As of Nov 3, 2009, the Phils need a pair of wins on hostile turf to defend their 2008 championship. From the other dugout, the Yanks can do what Steve Carlton and Tug McGraw did to KC in 1980 by finishing the series at home in 6 games. 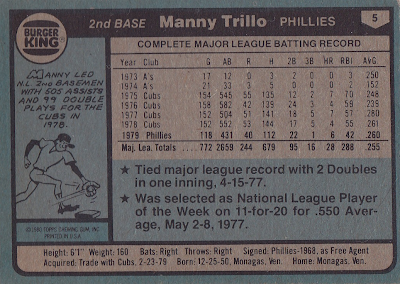 Manny Trillo won the first two Silver Sluggers for NL shortstops in 1980 and 1981, batting around .290 (with over 100 OPS+) each year. While he didn't burn up the base paths or hit for much power, 3 Gold Gloves and 4 All-Star appearances say something about his overall contributions to the team. Manny's the 1st player to start the All-Star game for different leagues in consecutive years. 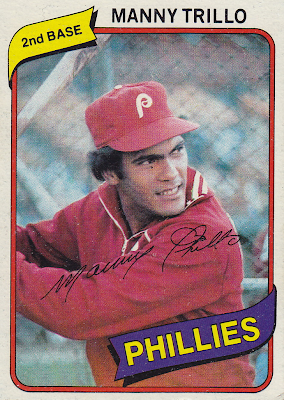 He represented Philly in 1982, but went to Cleveland for 1983 in the widely disparaged 5-for-1 Von Hayes trade. 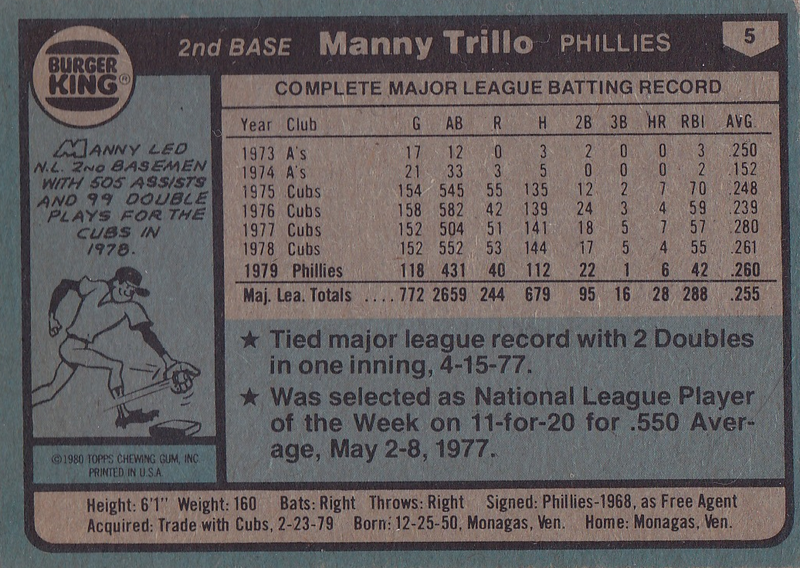 88 games and 1 AL All-Star start later, the Tribe sent Trillo to Montreal for a minor leaguer and cash. 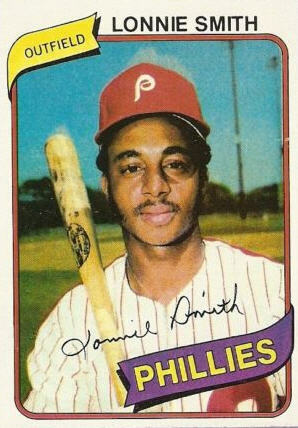 He finished the season with Les Expos, became a free agent, and signed with San Fran prior to 1984. After a mediocre couple of years in the bay, he played productively for Chicago from 1986 to 1988 and retired after a handful of games with Cincy in 1989. UPDATE: Baseball-Reference.com recently added a "Card of the Week" feature, profiling both cards and stats related to the pictured player. Its first entry featured the 1981 Fleer card of Lonnie Smith. Despite being on a 1979 Rookie Stars card, Topps didn't make a normal 1980 card for Lonnie. They did, however, craft a version for Burger King, #14 from today's set. Read more at B-R's Card of the Week! 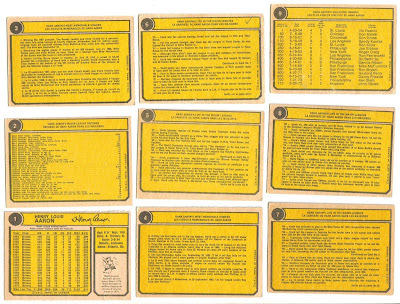 Burger King published a number of oddball sets from 1977 to 1987, including a handful of team-specific sets. Who did they pick for this honor in 1979? Why, it's the Phillies and Yankees! Such odd prescience for a company focused on quick turn-around. 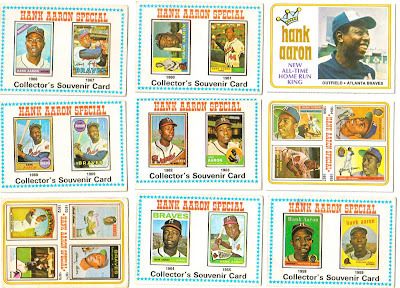 Topps licensed their 1979 design to Burger King as-is, so collectors often find them "mixed in" with the regular set. 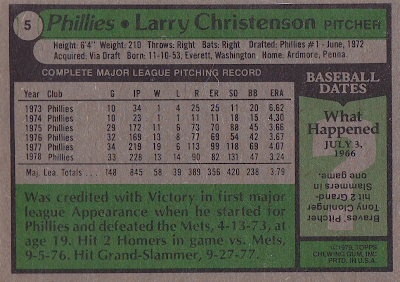 While the numbering obviously differs--Christenson is Topps #161--the 22-card burger checklist includes a few notables. The Super70s.com profile of the PHI and NYY sets includes an image of the Philly checklist and summary of both releases. I like team-based releases, so will add more Burger King #5s soon.